"Congratulations!" said the midwife, placing a tiny lump of wrinkly grey flesh on my wife's chest. I was a dad. After nine-and-a-bit months of pregnancy and many hours of labour here was a small person that we had made. A whole life that we'd just created from thin air. I looked at him as he slowly turned from grey to pink, and he looked at me with his dark eyes, sizing me up with an expression that said "So you're going to be my dad then huh? Interesting." I looked at his tiny hands and wrinkled fingers and he gripped my own finger with his hand. I was a dad. 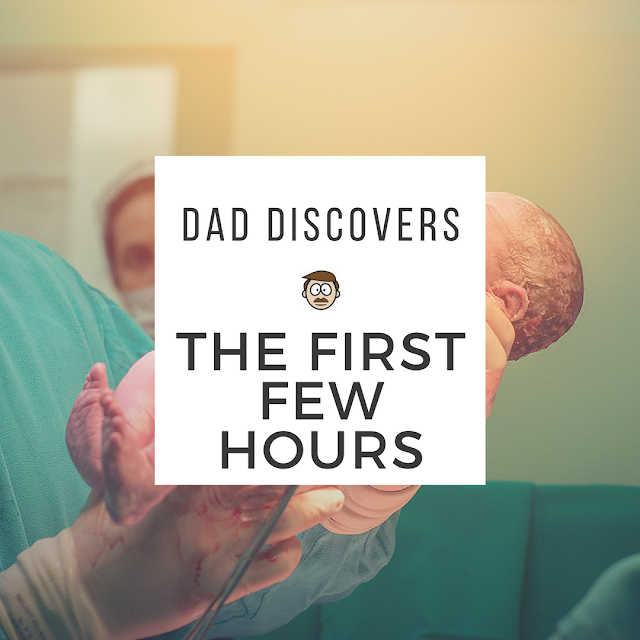 We stayed in the hospital for a while longer, I did my first nappy change and despite having prepared for his arrival for a very long time, we just looked at him in slight disbelief that he was there at all. Eventually, the medical staff told us we were being discharged and could all go home. By this time he'd been dressed in his first little babygrow and looked much more like a cute baby than the strange alien with long fingers, toes and a weird-shaped head. I went and got the new car seat from the car, spent ages making sure he was safely secured in it and prepared to leave. "Do we need to check in with anyone?" we asked. "No" said the nurse, "you're free to leave." "So... we can just go?" we said sceptically? "Yes! Congratulations and good luck!" said the nurse. So off we went down the corridor proudly carrying our child. When we walked out of the main hospital entrance, we both slowed down and looked behind us. Surely someone was going to stop us? Surely they weren't just going to let us leave with this precious little baby? Nothing happened so we kept going to the car park, fitted the baby seat carefully into the car and started the engine. We looked at each other again. Surely they weren't just going to let us drive away with this tiny child? Anything could happen! But again nothing happened, so we headed towards home, very slowly and carefully, in a state of relative shock. When we arrived home, we took him out of his car seat, put him into his new moses basket and looked at each other a third time. Surely there would soon be a knock on the door to tell us this was all a mistake and that we had to hand him back? Surely they weren't going to let two complete amateurs have unsupervised care of a newborn baby? But they had, and it was just the two of us now. Us and our baby and a lifetime of things to learn about each other. And then we had another thought. "What do we do next?" So we ate, we slept and we checked up on him every five minutes to make sure he was still alive. And he was. And he was the next day, and the day after that, and the week after that and the months after that. People came to visit and the whole thing was a blur of exhaustion, and at some point we turned into parents. CBeebies is great. Until you have kids you'll probably never have any cause to watch it, but once you do you'll be thankful for the BBC for creating it. It's brilliant. There are, of course, loads of other kids channels out there from CITV to Nickelodeon, Disney Channel to Baby TV, but most depend on a paid subscription of some kind, are predominantly American in content, and are bursting with adverts. CBeebies on the other hand is free (sort of), has no adverts and can generally be relied upon to serve up several hours of good quality content for your sprog. Needless to say there's a lot of different programmes out there, but these are my current personal Top 10 CBeebies shows. 10) Justin's House The almost reincarnation of Emu's Pink Windmill Show, hosted by the undisputed king of toddler TV, Justin Fletcher. He pops up all over the place on CBeebies but this one is the most fun. - Description of Hell in ‘Paradise Lost’ by John Milton. A Great Idea Soft play establishments were one of those things that I was vaguely aware of before having kids, without actually having any interest in. It’s a bit like the way that I’m aware of cricket, ITV Be and Luxembourg and have nothing against them but have no plans on giving them any of my attention. Hi I'm Jamie. Some bloke with a 2 year-old boy and a computer, but not necessarily in that order.